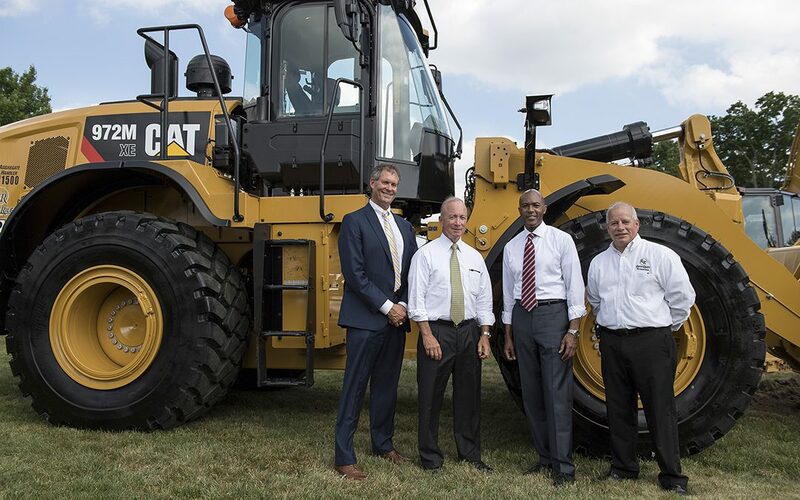 From left: John Dennis, mayor of West Lafayette; Mitch Daniels, president of Purdue University; Dale Bonner, executive chairman of Plenary Concessions; and Keith Rose, president and CEO of Rieth-Riley Construction Co. Inc. at the June 16 groundbreaking of the State Street Redevelopment Project. Photo courtesy of Purdue University. The U.S. 36 Express Lanes project in Colorado and Purdue University President Mitch Daniels were recognized July 14 as models of excellence for innovative transportation financing and project delivery during ARTBA’s 28th Annual Public Private Partnerships (P3s) in Transportation Conference in the Nation’s Capital. More than 200 people registered for the three-day event. The P3 Entrepreneur of the Year is given to an individual who has made outstanding contributions to the progress of P3s in the U.S. transportation industry. As Purdue’s president, Daniels helped establish the City of West Lafayette and Purdue University Joint Board as the partnership body for all aspects of the procurement and financing of the State Street Redevelopment Project. The project will revamp a major thoroughfare through downtown West Lafayette and Purdue University with a focus on better connecting the two communities to meet the needs of residents, students and businesses. The project is a design-build-finance-maintain P3 that seeks to modify traffic patterns on State Street through the Purdue campus. The project will promote multimodal travel features, including bike paths and pedestrian walkways, with the goal of enhancing safety for pedestrians, cyclists and drivers throughout Purdue and West Lafayette. The project is the first U.S. availability payment P3 project to be procured by a university and the first to reach financial close where the consortium’s bid included a privately placed bond with fixed credit spreads. Daniels, who became Purdue’s president in 2013, previously spent two terms as Governor of Indiana. In that role, he procured and reached an agreement on a 75-year lease for the 157-mile Indiana Toll Road in a deal that brought nearly $4 billion to the state. The P3 Project of the Year spotlights the value P3s bring to the U.S. transportation development. The 16-mile U.S. 36 Express Lanes project helped to alleviate congestion between Denver and Boulder by adding a managed lane in each direction for use by Bus Rapid Transit (BRT), High Occupancy Vehicles and tolled vehicles. It also reconstructed all existing pavement and widened the highway to accommodate 12-foot inside and outside shoulders; added new stations and electronic display signage to the BRT system; installed a separated commuter bike path along the entire corridor; reconstructed or widened several bridges along the highway; and added a Diverging Diamond Interchange at the McCaslin bridge. The delivery of the project was split into two phases. The $318 million first phase was procured as a design-build contract, which began initial construction work along the corridor. The $130 million second phase was procured as a P3/PPP, with Plenary Roads Denver selected as concessionaire to finance, design, build, operate and maintain Phase 2 construction work, assume TIFIA loan obligations and operate and maintain Phase 1. The project team included Plenary Group, Ames Construction Inc., Granite Construction Company, HDR Engineering, Broadspectrum, and Goldman Sachs.